Picking a theme can be a lot of work, but it can also add a lot of fun to any baby shower and can even simplify the preparation process, such as choosing invitations and planning a color scheme. Weï¿½ve compiled a list of the most popular fun and unique baby shower themes thatï¿½ll give you lots of baby shower ideas in order to make your baby shower extra special. Having a tea party theme for your baby shower is a wonderful way to celebrate, whether youï¿½re having a boy or a girl. Baby shower invitations can include a small teabag with the guestï¿½s name attached to it by a ribbon. These can also be used as name cards to seat to your guests (i.e. by tea flavor). Decorate with fancy china and fresh flowers like daisies or lilies. For added class, serve your guests croissants and scones along with their tea. Having a brunch-themed shower party is another unique baby shower theme. Serve your guests quiches and bundt cake with classy silverware. Baby shower games can include having guests make their own dishes, such as cupcakes, as part of a small team. 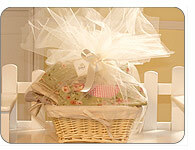 Hang up a clothesline and ask guests to bring different articles of baby clothing as gifts. When guests arrive, they can hang up the article of clothing theyï¿½ve brought. This baby shower theme is especially perfect for an outdoor shower party in your garden. Your babyï¿½s shower is the perfect time to start building his very own library. Ask guests to bring their favorite childhood books as gifts; serve a book-shaped cake as dessert. You can even have a guest sign-in book where guests can write messages to your baby. This also makes a great keepsake to give to your child later on in life. A couples baby shower party is a great way to include everyone in on the baby fun! If youï¿½d like to invite couples to your babyï¿½s shower, a barbecue baby shower is a great option. A fun game idea is to ask guests to bring baby pictures of themselves, then arrange them on a board and have guests guess who the pictures are of. Open gifts together with your partner. Assign each guest a diaper size in their baby shower invitations and theyï¿½ll bring that diaper size number as a baby shower gift. If many of your guests are also pregnant, you can create a "diaper cake" for the centerpieces, building each layer of the baby shower cake with bibs, a burp cloth and towels. Add accessories like toys, shampoos and bath supplies to each "tier" for a personalized touch. This baby shower theme adds an extra magical touch to your baby shower party. Intoduce your baby shower invitations with "Once upon a timeï¿½" Bake a baby shower cake and decorate it with a "B" (for baby and me!) You can even decorate each table according to a different nursery rhyme. A wonderful baby shower theme for twins. Ask guests to bring two of something. And group decorations like centerpieces in twos to play up the theme. Ask guests to bring a "my first" item for all the babyï¿½s milestones. Bring shoes for babyï¿½s first steps, soft rubber-tipped spoons for babyï¿½s first bite of solid foods. The possibilities are endless! Just remember to give one theme to each guest, or have guests pick out of a hat, so that no one gets the same theme. With these fun ideas, weï¿½re sure that your baby shower planning will be just as fun as the baby shower itself! Have a happy baby shower! Go to our forum to get ideas for a great baby shower theme.